The governorship candidate of the All Progressives Congress, APC, in Lagos State, Babajide Sanwo-Olu has vowed to solve the traffic gridlock in Apapa in the first 100 days of his administration if elected governor of the state in March. He spoke on Sunday during a governorship debate organised by ‘The Platform’ and broadcast live on Channels TV. Sanwo-Olu and other contestants were asked what they would do in the first 100 days in office if elected governor of Lagos State. He added that in the first 100 days, he would engage the private sector to drive the Lagos economy to prosperity. 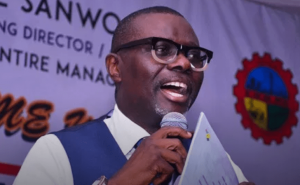 Sanwo-Olu stated that he would convene a town hall meeting to tell the public service that there were new ways of doing things. Also, the governorship candidate of the Peoples Democratic Party, PDP, Jimi Agbaje said he would address traffic gridlock in the metropolis by tackling potholes, as well as address the issues of waste management.